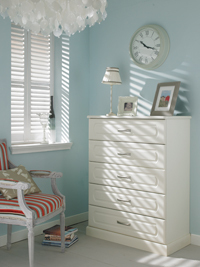 Book your free consultation with one of our friendly bedroom specialists. We'll discuss your requirements and show you our range of unique bedroom styles. Should you decide to purchase your new bedroom from us, our expert fitters will come and install it for you at a time to suit you. For quality bedrooms at prices to suit all budgets, Kitchens and Bathrooms are on hand to help. A great bedroom should be a haven of rest and relaxation; a place to escape to and recuperate after a long, hard day. We can help you make your dream bedroom a reality. Our bespoke design service means we’re on hand to make sure you get the most out of your space - and ensures that your bedroom is totally suited to your needs. Our high quality bedrooms always use only the best materials and techniques, with top-of-the-range features and accessories to finish it off perfectly. From luxuriously soft carpets to super stylish flooring, we’ve got all of the finishing touches you need. We are proud to supply stunning fitted furniture from Hepplewhite, meaning that you can rest assured that quality is never compromised. Specialising in optimal space-saving solutions suited to your space, we offer a choice of colours, styles and textures to help you customise your bedroom - with hundreds of options to choose from. Here at Kitchens and Bathrooms, we provide you with support from the initial ideas right through to the completion of your newly fitted bedroom. We pride ourselves on having the ability to offer everyone an open-minded, flexible approach to the design and build of our bedrooms, and we’re dedicated to making sure that every customer ends up with a brand new bedroom that truly represents their wishes. Whether you have your heart set on a particular style or theme, or you need some guidance and inspiration from the friendly and knowledgeable Kitchens and Bathrooms team, we’re here to ensure that you end up with the bedroom of your dreams. We offer a free, no obligation plan and design service with a full written quotation, including 3D CAD plans to present the designs in full colour - helping you to visualise your new space. Your quotation will include all electrics to Part P standards, as well as plumbing, plastering, decorating, tiling and flooring as per your requirements. Get in touch with our team to get a quote on your bespoke new bedroom today!